With over 20 years of experience in the field of Construction Equipments, the organization has been successfully designing, manufacturing, supplying and exporting Fly Ash Brick Making Machine (semi and fully automatic), AAC Plants (Autoclaved Aerated Concrete), Concrete Block Making Plants (semi and fully automatic), Paver Block Making Plants (semi and fully automatic), Tractor Mounted Loader, Mini Dumper, Dozer, Furnace Charger, Batching Plant and various construction accessories throughout India and few other countries outside India. We have more than 2 decades of experience and over 800 happy customers. With the restriction of usage of clay bricks as declared by government, there is a huge demand for bricks which are made up of Fly Ash i.e. an unwanted residue obtained from coal-fired power plants. 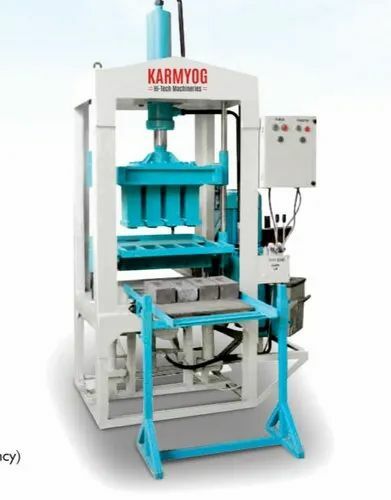 The demand for Fly Ash Bricks machine is increasing day by day as Fly Ash bricks are the most appropriate bricks for various infrastructure projects due to their high compressive strength and durability. Fly ash bricks are lighter in weight, environmental friendly, have smooth finish, longer life and are 20% less costly than clay bricks. by a state-of-the-art infrastructure, latest & most cutting edge testing equipments as well as excellent R&D department that help us in providing the best range of machines at economical rates to our esteemed clientele. Our client centric approaches, ethical business practices coupled with prompt delivery schedules have aided us in earning a remarkable market share in today's competitive business scenario. Based at Bhuj, Gujarat we have been able to easily connect with our vendors and customers across the country and globally. We deliver our machines in almost every part of India which includes Gujarat, Madhya Pradesh, U.P, Maharashtra, Rajasthan, Chhattisgarh, Orissa, Jharkhand, West Bengal, Assam, Haryana, Uttarakhand, Nagaland, Assam, Punjab, Andhra Pradesh. We also have our client base in South Africa, East Africa, Nepal etc. Quality has always been our first priority. Our unending efforts towards maintaining exceptional quality and precision has made us a reckoned company. Our quality controllers stringently monitor all the production stages to guarantee unmatched quality. Special care and meticulous attention is given while purchasing the raw materials from certified suppliers and distributors. We, Karmyog Hi-Tech Machineries believe that efficiency, performance and quality of our products decides our relationship with our clients. Therefore, we ensure to provide quality Automatic Brick Making Machine, Fly Ash Brick Making Machine and other machinery to achieve complete client satisfaction. We, Magic Zone International Private Limited is a foremost Manufacturer and Wholesaler of AAC Blocks, Fly Ash Bricks, AAC Block Jointing Mortar and much more. These are widely admired in the market for their top features and nominal costs. In order to cater variegated necessities of our respective customers, we offer products in various forms. Moreover, experts also check the quality of these products on diverse industry norms to ensure the quality.